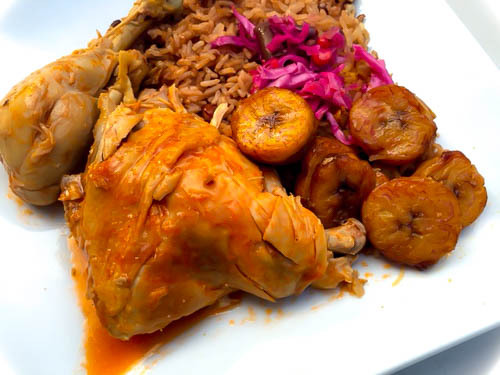 Poul nan sos (Haitian stew chicken) is absolutely delicious and one the most popular dish in Haiti. Clean the chicken with lime and sour orange juice. Rinse in hot water. Season chicken with epis, garlic, black pepper, and chicken bouillon cube. Marinate for 4 hours or overnight to allow flavors to meld. In a cooking pot, bring 4 cups of water to a boil over high heat and add the chicken. Let it cook for about 25-30 minutes or until cooked. In a saucepan, add a half cup of oil and transfer the chicken over; brown each side of the chicken. Stir in onions, peppers, tomato paste, and add a cup of water. Reduce heat and let it cook for another 15 minutes; simmering in the sauce. Serve warm. My husband is Haitian so I was looking for something that I could make for him. I tried and it turned out very very good. Thanks!!! !